One YOUz*r asked me last week for ideas on room layouts for her livingroom. While there's no one design rule that holds true for everyone, there are some general ideas that are good to think about when planning a space. 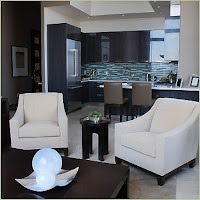 Here are a few hints from YOUz*d on putting together a great room. If you host a weekly charades night at your house that requires people to move around, you'll want to have an open area with moble furniture. 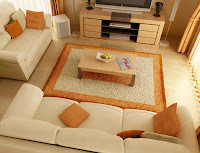 Instead of a couch and loveseat set, maybe you'll want to go with a couch and several matching (or nonmatching depending on your taste) chairs and ottomans that people can move around to form teams or create space. If your place is where everyone gets their weekly TV fix, you'll want lots of nice, comfy surfaces (couch, loveseat, plush chairs, floor cushions) arranged for optimum TV viewing. Make sure you have a focal point and layout the room to highlight this area. For some people it's a fireplace or architectural element. If you're like me, it's the TV! In my apartment, we played up the wall TV wall by adding a wood wall panel in a contrasting color, showcasing some of our favorite items on either side, and placing a dark wood record cabinet underneath the TV to ground everything. People with fireplaces in their room tend to have the most trouble creating a focal point since the fireplace and TV compete for attention. 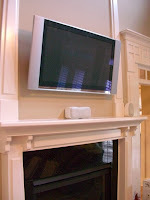 Nowadays, it's easy to remedy this by purchasing a flat-panel television to hang over the fireplace. If that's not in your budget, consider putting two matching armoires/bookcases beside the fireplace and use one of them to house the TV. This balances things out and lets the fireplace take center stage. A lot of people do their eating in front of the tube. Furniture makers responded by creating coffee tables with adjustable tops that raise to table height when you're eating and go back down when it's time for a little conversation. While it's a good idea, these tables are often rather bulky and don't always fit into the decor of a room. My opinion is to just make sure there are enough tables spread around the room for guests to place their food and drinks. 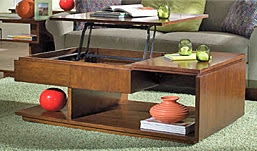 Buy a coffee table and a pair of end tables and you should be all set. Don't forget the coasters! If you're room is multipurpose or opens into another space, don't be afraid to use your furniture as a divider. Consider using your couch to divide a sitting and office space. For extra functionality, you can add a couch-height bookcase or console behind the couch to store books and binders in the work area and display reading lamps and decor for view in the livingroom. Many Boston apartments have livingrooms that open into the dining room. To fix this dilema, place a chair with its back to the doorway. This allows you ample space to walk between the rooms without losing valuable floor space in your sitting area. The key is to make sure you can easily get from one room to the next without having to walk through a maze. Playing up on height can add drama and space, especially in a small room. Go with low profile furniture; add large, tall art pieces; use floor-to-ceiling drapes; accent architectural elements such as fireplaces or crown molding. I painted the ugly oil pipes in my livingroom to highlight their height and bring the room upward. These are just a few of my personal tips. Since each apartment is different, you have to figure out what works best for you. Break design "rules", go with what YOU feel comfortable with, and have fun!